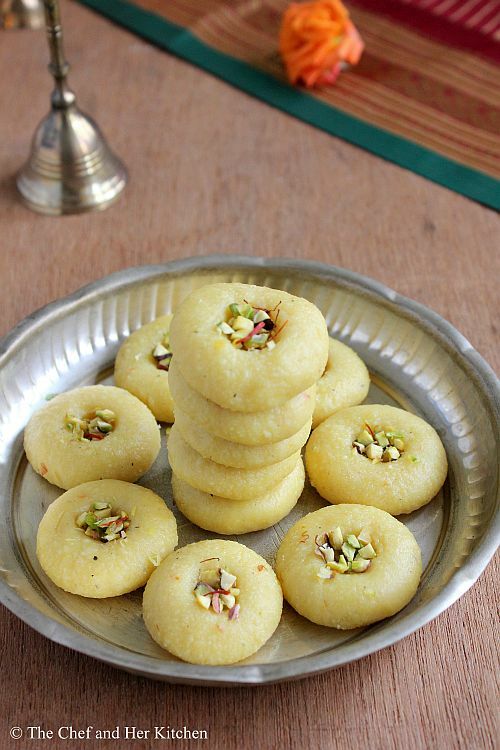 Diwali is nearing by and all the blogs are flooded with diwali recipes. Though I had plans to post a few new recipes but given some personal commitments I could not do so - so I pushed myself to post a couple of recipes before Diwali. 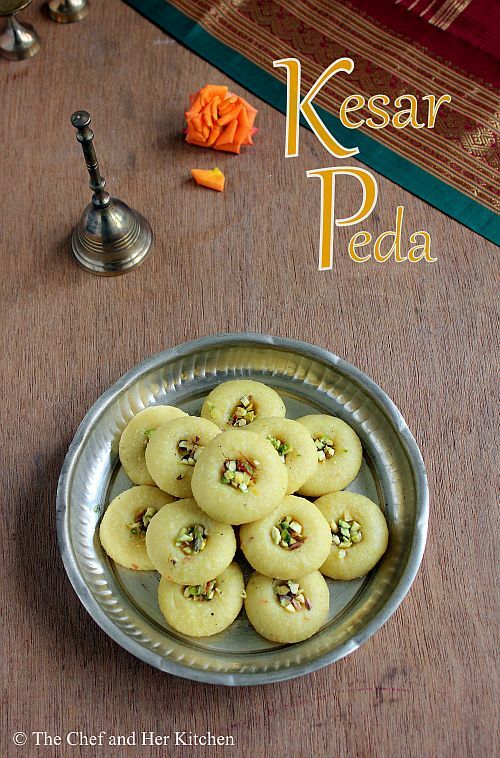 Kesar Peda is an interesting traditional sweet in India which can be prepared in two ways. The traditional method is to reduce milk and make it from milk solids but I have used the other version which is prepared with Khoya (Mawa). This is a simpler version, and can be prepared in just 20 mins. So those searching for quick sweet recipes for Diwali this one should help. 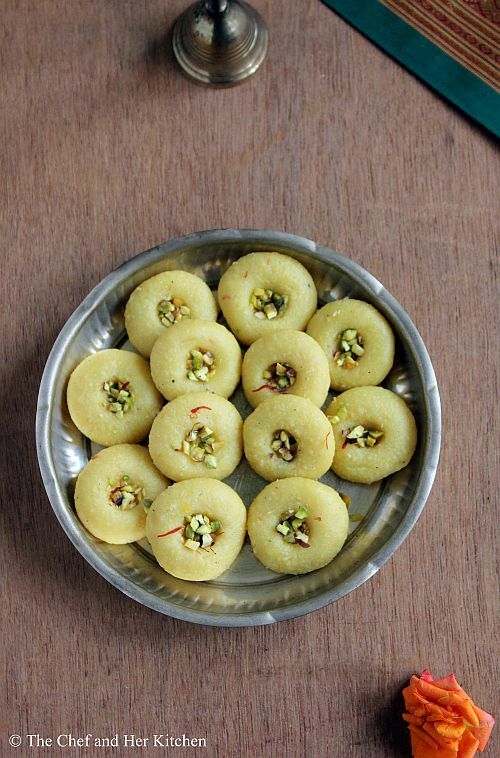 Kesar peda as the name suggests is yellow in color due to the saffron strands that are used - while when you buy it in a shop - the color is achieved through the use of synthetic colors - using saffron to get a natural color is much better from a health perspective and it also adds to the taste. 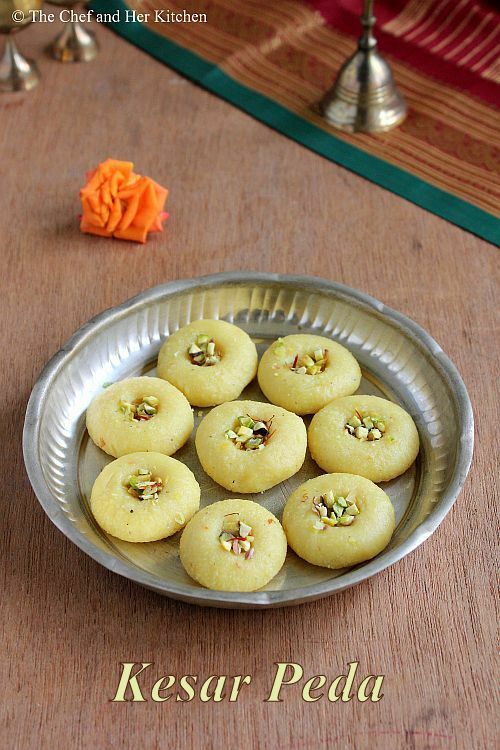 Do prepare this sweet for Diwali and enjoy with your family. Slightly warm the saffron strands in a pan and rub the strands in between your palms.Warm the milk and soak saffron strands in warm milk for 10 mins. Chop Pistachios into fine bits and keep aside. Crumble or grate the khoya nicely, if you are using frozen khoya thaw it thoroughly before using it. Heat ghee in a pan and add maida and fry till you get nice aroma. Add khoya, saffron milk and powdered sugar to the flour mixture and heat it on low flame by stirring it constantly till it bubbles and khoya melts.You can taste the mixture at this point and add more sugar if needed. Remove the mixture from flame and mash it nicely with wooden masher in circular motion until the mixture becomes fine and thick,this step makes the pedas soft.Let it cool until you can handle the mixture with your bare hands.Knead the mixture nicely for a couple of minutes. Divide the mixture into 15 equal portions and make even sized balls and flatten them, make sure the edges would not crack.If the mixture is sticking up grease your palms with ghee and prepare pedas.Once you make all pedas use clean finger and make a dent in the center and press finely chopped pistachios in the dent.Arrange them on a plate and leave them aside for an hour to set nicely. Remove them gently once they set and store it in an air tight container and consume with in 3-4 days or it can be stored 7-8 days if refrigerated. If you like you can add 1 tsp cardamom powder to the mixture once you switch off the flame. If you are using frozen khoya thaw it thoroughly before using it. 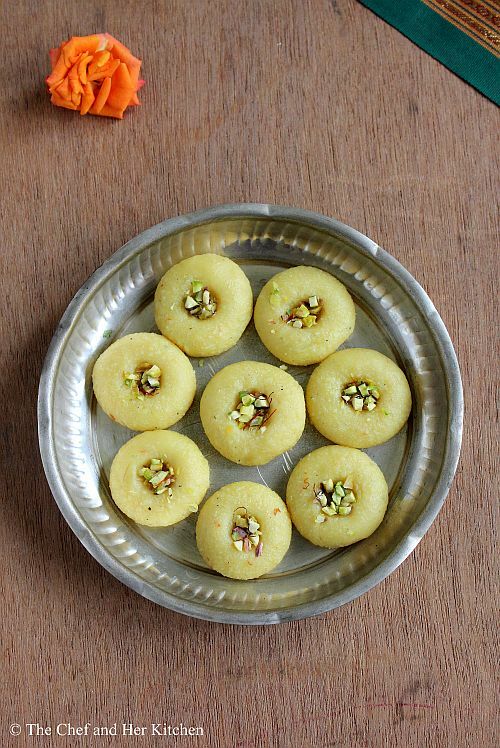 Instead of making pedas you can set the mixture in a greased flat plate and smoothen the top using a butter paper and cut them into different shapes using molds.Decorate with chopped pistachios and saffron strands. Do not over cook the mixture as it will turn the pedas hard. Thank you for sharing the recipe. I have sweetened khoya at home. Can I follow this recipe with out adding sugar to make the pedas?